The picture that you see here was the grim reality of Iraq six years back. Unfortunately, it is the same today. I took the picture barely a week after the U.S. led coalition forces invaded Iraq in April 2003 . 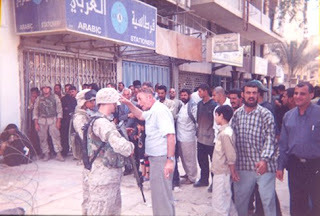 In the heart of Baghdad, a shopkeeper was fighting fiercely with the American troops who had taken position outside his shop. He wanted them out of his space. They were armed with the most sophisticated weapons and he had none. But he had no fear for his life. I think this one picture describes and portrays the indomitable and aggressive Iraqi spirit most aptly. The natives of this ancient civilization that we all have known as Mesopotamia have been through so much of violence and bloodshed in their centuries old history that they have no fear left in their blood.George W Bush and his allies, in their shortsightedness and incomprehension of the Iraqi psyche and the country's deeply factious social set up , created the kind of mess in that country that his successor, Barack Obama, who assumes office today, will have a hard time clearing up. Bush Junior's 2003 Operation Iraqi Freedom turned out to be Operation Iraqi Destruction and proved to be his regime's most aching liability. For one, it stripped the ferociously freedom loving Iraqis off their sense of freedom and sovereignty and two, it further widened the rift between Iraq's three main factions - the Shias, the Sunnis and the Kurds.In their over anxiousness to correct the historical wrong of repression and isolation of the Kurds and win over their alliance , the Bush regime gave the Kurds the lion's share in Iraq's ' America-installed democratic set up' .Doing so, it alienated the sunnis and the shias.Worse was that it did not even win them the Kurd community's loyalty to the state of Iraq.The Kurds, who have always considered themselves as separate entities did not share the American regime's enthusiasm for a democratic , united Iraq. Between the other two communities, the majority Shia and the minority Sunni populace of the country, the American regime could not strike a balance.Shias accuse them of siding with the Sunnis, whom they consider their most bitter rivals and Sunnis, while still nursing the grudge against the toppling of their most powerful leader , Saddam Hussein, now also blame the Americans of treating them unfairly against the majority Shias and the Kurds.Result is a deeply divided and chaotic Iraq, always on the boil and on the brink of a civil war.Suicide bombings and factional clashes are the order of the day and the one lakh forty five thousand plus American troops still on ground in Iraq have little but succeeded in winning over the trust and support of ordinary Iraqis. And therefore, Barack Hussein Obama, who assumes office today as the first Afro-American President of America has tough tasks cut out ahead for him.As a liberal, Obama has always opposed the American invasion of Iraq and later, the Bush regime's policies in the strife-torn land.In one of his famous speeches during last year's Presidential polls , he famously remarked, " I was against it in 2002, in 2003, 2004, 2005, 2006, 2007 and 2008 and I am going to end this war in 2009." He has even set a 16-month deadline for total troop-pullout from Iraq.Although, considering the sensitive security scenario there, analysts fear a civil war like situation in Iraq once American troops leave the country.And that exactly is Obama's challenge - extracting his troops out while ensuring Iraq's peaceful transition to democracy, with if not perfect, at least reasonable amount of peace between the three main factions of Iraq's hugely divided society , particularly between the Shias and the Sunnis. It certainly will not be a cakewalk for the forty seven year old American President who has come to the White House riding a huge wave of change.And it is not just America that is anticipating and expecting change from Obama.It is the entire world and like the rest of the world, Iraq too waits for its moment of change. It waits for the completion of its story..for its march towards freedom and long lasting peace. It was like one of those stray thoughts that begin quite randomly and carelessly and before you realise or take serious notice, overtake your mind and senses and soul completely.I was reading a description on the ancient and holy city of Varanasi (Benaras) when a quote by the acclaimed American author, Mark Twain caught my attention , " Benaras is older than history, older than tradition, older even than legend, and looks twice as old as all of them put together," Without saying much, these words conveyed everything and filled and possessed me with the overpowering desire to explore the legendary, ancient and holy land of Lord Vishwanath. And so in the last week of the year's last month, we set out on a curious and inquisitive journey to the holy city of Varanasi, which is also known as Kashi in Hindu scriptures.But late December in northern India is not a very good time to undertake long journeys.Dense clouds of fog and smog envelop towns and cities and due to poor visibility, more often than not , trains and flights get delayed, sometimes for hours and hours at a stretch.In our excitement at exploring the legend and antiquity of Benaras, we failed to foresee this cumbersome reality of north Indian winter.And as a consequence, ended up spending a good twenty hours, either waiting for the train or languidly whiling away time in our compartment once it started the journey.All this while, the anticipation and excitement continued to build up. 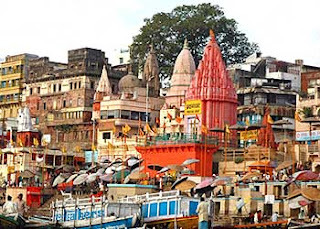 We finally reached Benaras at night the next day instead of the scheduled early morning arrival the same day ! The body was tired but the mind felt surprisingly fresh and active.Did it have something to do with the cool and sacred breeze coming from the direction of the holy Ganges or had the resilience and quiet strength of the ancient city of Lord Shiva started rubbing on to us ? Afterall, it takes an exceptional and extraordinary amount of physical, material and spiritual strength to be the oldest surviving city in the world ! The first sight that caught the eye as we set feet in Benaras was that of the imposing structure of the city railway station.The building modelled like a temple complex was certainly the most innovative design for a railway station that I had ever seen.There was a chill and sharpness in the wind and I shrunk further in the warmth of my jacket.We took an auto rickshaw and set out on what turned out to be a two-hour long hunt for a decent hotel through the narrow lanes and bylanes of the city.It was way past nine pm and the darkness and the fast thickening fog were making the search more difficult.We finally found a place to check in barely three hours before the pre-dawn Mangala aarti at Kashi Vishwanath. We had just about two hours to freshen up and absolutely no time to catch a nap. Packing ourselves in layers of clothes, we took a cycle rickshaw ride to the temple at about two in the morning.It was a brief but very quiet and contemplative ride through the empty, fog laden streets of the city.The temple is located in the heart of the city on the western bank of the holy Ganges.The area is old and congested and like all holy places, no vehicles are allowed inside.Besides, the lanes leading to the temple are too narrow for any vehicle to be able to move about freely.There was heavy security at the entrance to the pathway to the temple even at that early hour.Heavily armed security personnel guarded all the important points leading to the temple.We were told that the security at Kashi Vishwanath was particularly beefed up after the terrorist attack on another famous temple in the city, the Sankatmochan temple, in March 2006. After all the security checks, we were finally ushered inside the small Kashi Vishwanath temple complex where the jyotirlinga of Lord Shiva is enshrined.It is said that one can earn the merits of darshan of all the twelve jyotirlinga sacttered in various parts of the country by a single visit to Kashi Vishwanath and therefore, every day, thousands and thousands of devotees from all across the world throng the temple complex to seek spiritual peace and divine blessings.This Shiva temple is believed to have been there in the site for thousands of years.But due to invasions, it has been destroyed and rebuilt a number of times.The current structure is believed to have been constructed by Maharani Ahilya Bai Holkar of Indore in 1780.The Vishwanatha temple consists of a mandapa and a sanctum.The sanctum has a linga set into the centre of the floor in a square silver altar. The Linga is of black stone. Once inside, we joined other devotees at one of the four entrances to the sanctum.The Shringar ceremony of Lord Vishwanath had just started amidst chanting of holy mantras by the group of priests performing the pooja.The linga was bathed with water, milk, ghee, honey and then decorated with offerings of fresh flowers and garlands.Fresh new clothes were placed on each side of the linga within the silver altar.There was a magic in all those chantings and prayers and as I looked upwards , I saw the most beautiful site of my life..through the early morning fog, the golden temple spirals glistened and sparkled majestically as the leafless branches of an old tree caressed them softly. As the Shringar ceremony got over, all of us looking at it from outside the sanctum were asked to come one by one for darshan from closer quarters and for making whatever offerings we had brought for the Lord.At the crack of the dawn,accompanied by the unintrusive and soft strains of tanpura, the legendary M S Subbulakshmi's soulful rendition of the Kashi Vishwanath Suprabhatam announced yet another spiritually enlightened morning within the sacred premises.It was the beginning of just another ordinary day in Benaras, but to my deeply awakened mind and senses, it seemed the most important moment of my life. Phew!!! It's been a whirlwind time as I just wind up my fifth journey in the last few weeks! Yes, I have been travelling most of last month, sometimes for work and sometimes, for reasons personal. 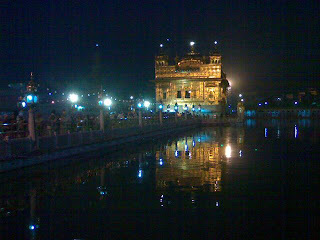 It all began with a trip to Amritsar early December, in fact, I wasn't supposed to travel to Amritsar. It was to be a quick trip to Kurukshetra.We finished in Kurukshetra quite early, and as luck would have it, caught glimpse of a milestone that said 'Amritsar 380 km'. Something clicked inside, I now call it the pull of ' Darbar Saheb ' (The Golden temple), and we immediately decided to drive all the way to the holy city for darshan. It was a long but pleasant journey and we managed to reach the quaint town before dusk.Checking into a hotel close to Darbar Saheb, we decided to visit the holy shrine early next morning.At night, a stroll through the narrow lanes and bylanes of Amritsar took us back to the times when this historic border town had not yet seen the bloodshed and violence of partition.Nothing seemed to have changed , yet everything had changed .There was an unmistakable calm and serenity surrounding the city.One did come across the ocassional mall and Mcdonalds, but the city, it seemed, had succeeded in retaining and preserving its heritage and old world charm. Community work (Sewa) lies at the heart of the Sikh religion and hence, early next morning, as we walked through the gates of Darbar saheb, we saw Sikh men and women, young and old alike, washing the marble walkways along the sacred pool with milk and water.The Golden temple, splendid and magnificent in its divine aura, sat in the middle of the crystal clear waters of the sacred pool. The entire atmosphere was reverberating with recitations from the Guru Granth Saheb by the granthis inside the sanctum. Legend has it that before his death, the tenth Sikh guru, Guru Gobind Singh, told his people that there would be no more living gurus after him and they must follow the Guru Granth Sahib ( the Sikh holy book).From that point on, the text remained not just the holy scripture of the sikhs, but is also regarded by them as the living embodiment of the Ten Gurus.The Guru Granth Sahib consists of more than one thousand pages of teachings, guidance to good living and hymns.The hymns and teachings are called ' Gurbani ' or ' Word of the Guru '. To the Sikhs, the Granth Sahib is more a living saint and therefore, every morning, it is carried in a procession to the sanctum and put to bed at night. We watched the ceremony in the morning with much reverence, heads bowed and eyes half closed in worship.There was still some time for sunrise and as we sat along the peaceful waters of the beautifully illuminated holy shrine, I marvelled at the never failing ability of faith and religion to soothe and calm the human soul.Although a Sikh shrine, Darbar Saheb is visited by people from all walks,sections and faiths of Indian society and I caught a pleasant sight of some young Buddhist monks posing for pictures.In their curious and happy faces, I could see all matters of religious dispute and conflict evaporate.Pluralism, I concluded , however problematic it may seem, also happens to be the biggest strength of this country. Later that day, we embarked upon a pilgrimage of a different kind. 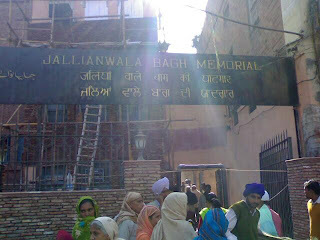 Close to Darbar Saheb, is the Jallianwala Bagh. Through the busy early morning streets, we covered the small distance on a cycle rickshaw. The rickshaw puller was an old Sikh man with a flowing white beard. He told us that he had also lost an uncle in the brutal massacre and to this day, his large, extended family worships him as a hero and martyr. The board at the entrance to the historic site read – ' This soil has been made pious by the blood of nearly two thousand patriotic men, women and children .' My heart skipped a beat and I gave out a sigh.Closing my eyes, I tried to picture those violent moments of terror , exactly eighty nine years ago, when the British Army Commander General Dyer made the reckless decision of ordering his troops to open indiscriminate firing at an unarmed gathering of innocent men, women and children.Their mistake – they had gathered there for a peaceful pro – independence meeting.Records say that the firing lasted about ten minutes and more than sixteen hundred rounds were fired in that small duration.One could still see bullet marks on the walls ,carefully encircled.The only exit passage from the park was blocked and the poor people holed inside had nowhere to go.We also saw the well within the premises in which many of them jumped to escape the bullets only to perish in its never ending hollowness.And as I looked down into the well, I could hear echoes of voices calling out for help.They were all unsung heroes of our freedom movement and it truly felt like a pilgrimage visiting the site of their martyrdom ! P.S. - I wish all my fellow bloggers and readers a very happy and fulfilling new year !